British Columbia, listen up, wise up and measure methane leakage! Natural gas’ reputation as a clean alternative to coal relies heavily on the drilling and fracking companies being ultra-cautious and preventing the methane from leaking. A leak rate of anywhere >3%, and the methane supercharges climate change due to its high global warming potential. Via the Washington Post, here’s more data that drilling companies are allowing methane to escape into the atmosphere at far higher levels than claimed. This data adds to earlier measurements by National Oceanic and Atmospheric Administration (NOAA) and the University of Colorado in Boulder that showed high leakage rates in Colorado and Utah. This also adds to the body of work from Cornell University (Howarth et al. showing high leakage rates. It is pretty clear that escape rates vary from area to area, and also on the ability/willingness of fracking companies to control emissions. What is BC doing about this? As DeSmog pointed out last year, nothing. We assume that our leak rate is 0.4%, best in the world. While BC’s companies are required to “report” methane emissions, they are based on modeling, not measurement. It is pretty clear now that these numbers are not verifiable or reviewable. The Sightline Institute alerted me to the scope of assessment for the proposed coal export terminal at Cherry Point in Washington State. The Washington Department of Ecology, is going to require in-depth analysis of four elements that the coal industry had desperately hoped to avoid: A detailed assessment of rail transportation on other representative communities in Washington and a general analysis of out-of-state rail impacts. An assessment of how the project would affect human health in Washington. A general assessment of cargo-ship impacts beyond Washington waters. An evaluation and disclosure of greenhouse gas emissions of end-use coal combustion. via Scope of Gateway Pacific Analysis is Bad News for Coal Industry | Sightline Daily. Contrast with Canada’s Kinder Morgan pipeline review. This pipeline aims to triple the flow of tarsands oil through an already existing old pipeline. Tankers carrying 900,000 barrels of bitumen will ply the Salish Sea every day. But the scope of the review won’t encompass the potential impacts of the oilsands crude that would be in the pipe, or the end-use for the oil. 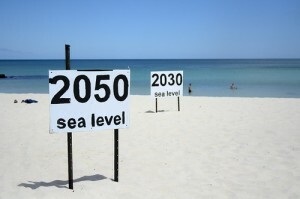 At a time when greenhouse gases already emitted are set to cause sea level rise that will affect millions, even in affluent countries like the US, considering climate impacts of all fossil fuel projects seems to be a no-brainer. Obama repeatedly mentions climate impacts as an important factor in the US review of the proposed Keystone XL pipeline. The other part of this review that is more comprehensive than Canadian reviews is the explicit leadership of the state environmental agency, the Washington State Department of Ecology. Here in British Carbontaxia, the government gave up its review rights on the Enbridge pipeline. Industry boosters claim that individual pipelines have nothing to do with the climate, and that the oil will flow one way or the other, sometimes to tragic effect. This Pembina post is a quick start on what the tarsands mean for climate. Note that building these pipelines is key to increasing capacity, hence emissions. Without pipelines, the tarsands will not grow as fast. So, any review that does not take climate impacts of fossil fuel transport into use is not a serious review. A barrel of tarsands oil (at 20% greater than average emission) is around 0.5 metric tonnes of carbon. The Kinder Morgan pipeline would carry approximately 170 million tonnes (Mt) worth of carbon equivalent per year. The greenhouse gas emissions in BC in 2010 was 63 Mt. Surely, we need to consider climate impacts! Just the incremental impact of tarsands oil (more intensive than average) is itself worth about a billion tonnes of carbon over a 50 year lifespan. Canada claims to align with the US on greenhouse gas mitigation actions. Clearly, this is one of those “not intended to be factually accurate” statements. Picture courtesy go greener oz used under a creative commons licence. 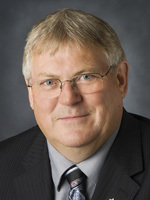 Is BC’s agriculture Minister Pat Pimm a climate denier? From Minutes of Wednesday’s Committee C meeting, to me via Torrance Coste on facebook (can’t link), some disturbing words. N. Simons: Does the minister agree that climate change is human caused? Hon. P. Pimm: Thank you very much, and welcome to the discussion this afternoon. Hon. P. Pimm: I think there are many varying opinions on climate change, and we all have our opinions. I’m sure you have your opinion, I might have my opinion, and I think we’ll just leave it at that. via Hansard — Committee C Blues — Wednesday, July 17, 2013 p.m.. Very troubling if true. Climate change will have many impacts on agriculture in BC and worldwide and a minister who thinks climate change is a matter of opinion doesn’t belong in positions of power regardless of portfolio. Stay tuned. I hope this is some kind of transcription error. Animated GIFs can be useful too! I read a peripherally related blog post on a book about experiencing local climate change and that set me thinking a bit. I like this sentiment a lot, and agree wholeheartedly. The book (I haven’t read it) appears to talk about local ecosystem adaptation, which got me thinking about adaptation in general. When we talk about climate change adaptation, we need to be very specific on who/what can/will adapt, and what community engagement will entail. Of course, I believe mitigation, or minimisng the causes comes first, but this post is primarily about adaptation. Species will adapt, so will ecosystems, and so will many humans. The Earth will, as well. It will just be a different world. Those of us living in affluent countries will feel the pain peripherally and will have enough buffer to change our ways of life. Some of us may even find ways to profit. Adaptation is not a choice for the majority of humans on this planet that live in poor, coastal and vulnerable areas. They do not have the money to adapt, the effects on their ecosystems are bigger and faster, and we will not let them move to safer countries like Canada. They will lose land, resource, and when they have to fight to survive, their wars will be treated as caused by their virtue or ethnicity rather than being caused by our past and present consumption. Much of the resources that could mitigate effects may already be controlled by those who can profit from the resources. Humans will have to adapt, and use any and all strategies, but there’s no “we” in climate change adaptation, there’s the vulnerable and the not-so vulnerable. So, it is insufficient to only think locally. We aren’t the first humans who will be forced to move because of abrupt climate change. But those needing to move this time will face closed borders and hostile states. We have seen time and again, resource stress increases racism and xenophobia, and decreases trust. What can affluent states do? For starters. Decarbonize. WIth intention, haste and unilaterally. Help less affluent countries increase wealth, quickly. Help less affluent countries decarbonize, if less quickly because 2 is more important. Think long and hard about their borders, because current projections call for millions of environmental migrants. We are, of course seeing the opposite. Carbon infrastructure in US and Canada is being expanded. Resources in less affluent countries are being developed for the use of the affluent (not always from affluent states). Trade wars being fought to protect affluent interests over cheap expansion of non-carbon infrastructure. Of course, race-based immigration policy, while not officially stated as such any more, is still operational. We have a long way to go as a species to help everyone adapt to climate change. Humans are generally in a better place to take the necessary steps than we’ve been in the past, but the work should have started 20 years ago. NDP leader Thomas Mulcair has finally listened to the legions of Globe and Mail comment thread participants (and some other people, of course!) who repeatedly urge policy makers and oil companies to build a pipeline West -> East. I believe Bob Rae has talked about this idea approvingly as well. Why? Because Western Canada exports oil at a “discount”, and Eastern Canada pays “full price” from non-Canadian sources. In a speech to the Canadian Club of Toronto at the Royal York Hotel, the federal NDP leader gave his clearest sign of support yet for the notion of a West to East pipeline that would allow producers to receive higher prices for their crude oil. The NDP leader’s speech also repeated his concern that western energy developers are not paying the full cost of the environmental consequences of their projects. He said this is leading to an artificially high Canadian dollar, which hurts other sectors of the economy. The full text of his comments can be seen at iPolitics and has much more than Globe and Mail Report (it wouldn’t have fanned the flames otherwise). Mulcair spoke about this pipeline, he also talked a lot about income inequality, robust government, and making polluters pay. He talked about strengthening environmental safeguards, ending fossil fuel subsidies and more. What he didn’t say: That tackling climate change requires a fundamental transformation of our system. Sometimes, what is not said is more important than what is said. If this proposal to use Canadian oil more “judiciously” by building a short-term closed supply chain is just part of a clear plan to go to a renewables and demand-reduction based energy transformation, propose away. We do need to hold both these truths in our heads at once: The tarsands are a big source of short-term revenue feeding our fossil fuel based culture, and unchecked climate change will kill many. It isn’t possible to cut fossil fuel use to zero next year, but it is imperative to cut emissions from fossil fuel use to near zero in the medium-term. Any policy that makes sense within that main objective should be looked at on its merits, but ending fossil fuel emissions soon HAS to be a cornerstone of any progressive energy policy, the crisis demands no less. So Mr Mulcair, propose oil pipelines if you wish, it may make for good short-term politics (read comments below the article), and who knows, maybe even tolerable policy. But remember to frame it as part of the necessary energy transformation. Politics is messy, and lasting change requires a broad coalition, don’t alienate progressive supporters right away. 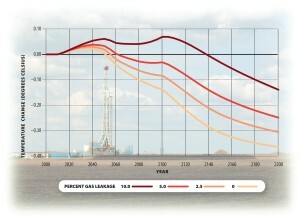 US CO2 Emissions down due to Natural Gas. GHG Emissions? Not so fast! Coal is evil, for many reasons, natural gas is less evil, but don’t tout its climate benefits, it has none. While natural gas is a much cleaner burning fuel, and its mining is less harmful than coal’s, there’s a big variable that doesn’t get discussed very often in the media, its leakage during mining, processing and transport. Methane is 25 times more potent (pdf) than CO2 as a greenhouse gas. So, it would seem that knowing how much escapes into the atmosphere would be a fairly important variable. It is very easy to estimate CO2 emissions from burning natural gas, it is much more difficult to measure fugitive and diffuse emissions from natural gas, fracking or otherwise. After all, the emissions occur at industrial sites controlled by drilling companies who have no interest in releasing that data. Also, it is site, and technique dependent. A conscientious driller may be able to avoid most leaks, but where’s the motivation? Natural gas is very abundant, and the price it is selling at demands high volume production and low margins. No need to plug the leaks, just the whole thing flow. 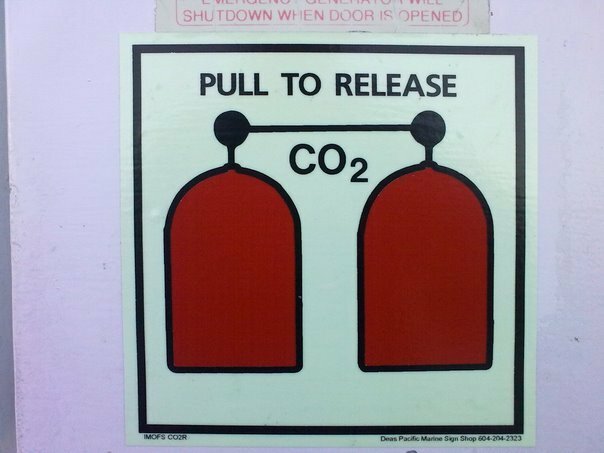 The scientific community and environmental community is well aware that comparing natural gas and coal is not as simple as looking at CO2 emissions. Methane and CO2 also have different lifetimes in the atmosphere, with methane being shorter lived, but forcing more intensely. The short-term and long term prognoses are therefore very different. Three separate papers (see references) have looked at this issue and concluded that natural gas is no panacea. Alvarez et al still espouses natural gas as a bridge fuel, but Howarth et al and Wigley are less optimistic. Note that under all scenarios, even under zero leakage, natural gas use actually causes an increase in short-medium term climate forcing. Why? Dirty burning coal also puts out enough sulphur dioxide into the atmosphere to create fine particles that reflect incoming sunlight and cancel out some warming. It takes until 2050 at least for climate forcing from natural gas to start showing benefits over coal. Even then, the benefits are not sufficient to fight climate change. Wigley estimates that the change is 0.1°C “out to at least 2100”, big whoop. So, what exactly might the leakage rate be? Industry and the US Environmental Protection Agency estimate it at 2% or less. When Pétron et al. went around measuring it around Denver, they measured it at 4%, with pretty high uncertainty, which makes natural gas fairly useless for fighting climate change. It is troubling that people treat this transition to natural gas so cavalierly. One doesn’t even need to look at all the problems arising from fracking for natural gas use to be no panacea. There is some evidence that natural gas investment is also driving out wind and solar energy investment. Here in BC, our wonderful Premier Christy Clark declared that natural gas was clean energy as far as the government’s policy framework was concerned. The opposition, and government-in-waiting NDP also thinks natural gas is clean. This is disturbing, and very shortsighted. What I say is not new, Joe Romm put it well “Natural Gas is a bridge to nowhere“, unless a very high carbon price is established (I don’t see one today, do you?). Howarth, Robert W., Renee Santoro, and Anthony Ingraffea. “Methane and the Greenhouse-gas Footprint of Natural Gas from Shale Formations.” Climatic Change 106, no. 4 (April 12, 2011): 679–690. Wigley, Tom. “Coal to Gas: The Influence of Methane Leakage.” Climatic Change 108, no. 3 (2011): 601–608. Alvarez, Ramón A., Stephen W. Pacala, James J. Winebrake, William L. Chameides, and Steven P. Hamburg. “Greater Focus Needed on Methane Leakage from Natural Gas Infrastructure.” Proceedings of the National Academy of Sciences (April 9, 2012). http://www.pnas.org/content/early/2012/04/02/1202407109. Pétron, Gabrielle, Gregory Frost, Benjamin R. Miller, Adam I. Hirsch, Stephen A. Montzka, Anna Karion, Michael Trainer, et al. “Hydrocarbon emissions characterization in the Colorado Front Range: A pilot study.” Journal of Geophysical Research 117, no. D4 (February 21, 2012): D04304. Bridge to Nowhere featured image courtesy GarlandCannon Flickr Photostream used under a Creative Commons Licence. The regular community bus driver (let’s call him Jack) that gets me from downtown Sidney to Industrial Sidney every morning is fantastic. He knows his passengers (it is a community bus, so just a few of us), he knows which bus we come into town on, he even drops us right outside of work instead of at the regular stop. He saves me 10 minutes every day, and does it in style. Thanks! He also gives us five minute talk radio type banter with his friend in the front seat, who I suspect rides the bus just for this purpose. We catch a lot of transit gossip, union gossip, hockey gossip and occasional monologues on the paeans of hard work, family and always speaking up. Somebody should hire this guy, he’s articulate, he’s passionate, he communicates clearly, great radio attributes. Jack is also a climate denier who has the pleasure of ferrying Andrew Weaver, Victoria’s most famous climate scientist, to work some mornings. I hear one side of his “debate” with Weaver, and I hear Jack reel off all kinds of denier science theories about evaporation, clouds, scientists who can’t predict the weather, etc. His talk show partner chimes in occasionally with similar “sciencey” sentences that make little sense to me. I think Andrew Weaver gets into it, because he takes his role as climate change and science communicator very seriously and according to Jack, it’ a lot of back and forth between the two. So, as someone who thinks climate change is a serious issue, is it not my responsibility to jump into this debate? Here’s an otherwise stand-up guy who appears to be very misinformed and misled on basic climate change facts, good opportunity to change minds, right? I am not so sure. Here’s David Roberts of the Grist synthesizing the state of the art on science communication and Dan Kahan’s recent study published in the Nature Climate Change Journal (Free article!). The answer might seem to be obvious: ignorance! People just don’t understand the science. <snipped> However intuitively plausible this answer might be, it suffers from one important flaw: It is wrong. Better educated people are not less likely to be skeptics. Greater scientific literacy and reasoning ability do not incline people toward climate realism. Where skepticism exists, additional information and arguments only serve to reinforce it. It does not follow, however, that nothing can be done to promote constructive and informed public deliberations. As citizens understandably tend to conform their beliefs about societal risk to beliefs that predominate among their peers, communicators should endeavor to create a deliberative climate in which accepting the best available science does not threaten any group’s values. Effective strategies include use of culturally diverse communicators, whose affinity with different communities enhances their credibility, and information-framing techniques that invest policy solutions with resonances congenial to diverse groups. Perfecting such techniques through a new science of science communication is a public good of singular importance. The answer is better peer-to-peer communication where trust has been built. This is hard, grassroots work. Update June 1: David Roberts has a new post that makes some excellent points on winning the climate culture war. 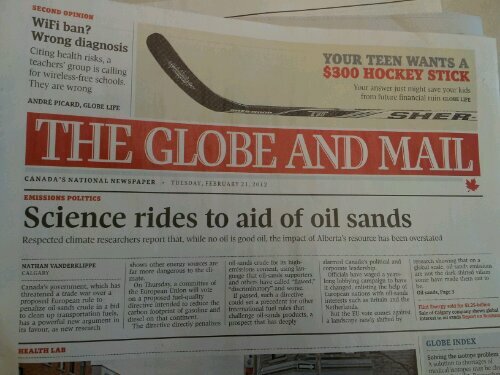 Science Rides to the aid of the Oil Sands, apparently. Science Rides to the Aid of Oilsands?? Words fail me, oh Globe and Mail. Worst headline ever. Weaver and the Tarsands: What the media missed. It appears that Canada (or the part I follow) is all a twitter about an interesting analysis ($$$) by prominent climate scientist Andrew Weaver and his colleague Neil Swart that counts up all fossil fuel reserves, then converts them into global temperature increases based solely on their combustion CO2 emissions potential. It turns out that oilsand reserves are dwarfed by the available coal and natural gas reserves and overall tarsands contribution to temperature increase is modest. If the entire Alberta oil-sand resource (that is, oil-in-place) were to be used, the associated carbon dioxide emissions would induce a global mean temperature change of roughly 0.36 °C (0.24–0.50 °C) However, considering only the economically viable reserve of 170 billion barrels reduces this potential for warming by about tenfold (to 0.02–0.05 °C), and if only the reserve currently under active development were combusted, the warming would be almost undetectable at our significance level. The Canadian media has chosen to play up just the fact that on a global scale, the project will result in a small increase in global temperature, so the oilsands are okay to exploit. Weaver’s comments to the media posit this as an either-or, coal and natural gas = bad, oil = okay. Knowing him to be a very intelligent person, I suspect this is some selective quoting. Also, oil is primarily used to fuel transportation, coal and natural gas are used for electricity generation, so I am curious as to what Prof. Weaver is suggesting here as far as using oil reserves to wean us off coal use? Would the plan be to use all the money that we get from exploiting the tarsands to develop an electricity infrastructure that puts efficiency, reduced electricity use, 100% renewables first? I wish! I don’t see that happening. Alberta is currently powered mostly by coal, and if the Federal government is serious in its stated goal to phase new coal out (which is fantastic), then Alberta would switch to natural gas to fuel its tarsands exploitation, and that would not be okay either! Also, these infrastructures are all linked. A lot of BC’s natural gas and proposed big damaging dams like Site C are designed to fuel the tarsands. A province and by extension, country that makes most of its money by taking the resources it was provided for free, and selling them at great profit is not likely to want to transition away from that. It was interesting that a few weeks back, Mark Jaccard, yet another prominent BC climate scientist (we are blessed) looked at the same issue and came to the following conclusion. Canadian tarsands must contract as part of a global effort to prevent a 4 degree increase in temperatures and catastrophic climate change. So, is this Jaccard vs. Weaver? Is the Swart and Weaver message that simple? Are they actually saying that it is okay to exploit away because it makes no difference? The claimed economic benefits of exploiting the vast Alberta oil-sand deposits need to be weighed against the need to limit global warming caused by carbon dioxide emissions. That’s how the paper starts. It then calculates global warming potentials based on reserves, current production, total “in place” (present, but not always exploitable) and shows that coal and natural gas are by far the greatest potential contributors. This is of course simply because we have much greater reserves of coal and natural gas, so their global warming potential is going to be huge. The paper makes no mention of rate of use, or whether it is humanly possible to use all that coal and natural gas, and what kind of population growth, and per-capita consumption that would entail. Here’s a very important calculation from the paper that will be lost in the details. To limit temperature rise to 2 °C or less, the allowed, cumulative per person future carbon consumption is 85 tons of carbon. The per-capita carbon potential of the tarsands alone to US and Canada is 65 tons of carbon. So, by itself, the proven reserves (10% of what’s there) of the tarsands can eat up 75% of our allowed carbon budget, not so small, is it. Here’s the last paragraph from the paper, another big trajectory argument. Absolutely, 100% agreed, but this is not what the media message is at all, interesting. So Swart and Weaver point out that we need to avoid commitments to new infrastructure promoting fossil fuel dependence, and that building projects like Keystone XL and the Northern Gateway signal a serious commitment to using the entire tarsands. The message in the paper is much more nuanced, and more measured than what’s in the media, not surprising. I have long since come to the conclusion that this is not about counting of individual carbon atoms and their non-measurable global warming contributions, of course any single project will not tip us over one way or the other. It is about trajectory. To use two smoking analogies, the argument against smoking is not that the next cigarette will kill you, it is that smoking will kill many people in a population over a lifetime. More aptly in this case, the argument is that Grand River Enterprises, a small Canadian cigarette concern, doesn’t contribute as much to smoking deaths as does Imperial Tobacco, so it is somehow different and okay. Every major fossil fuel commitment we make is a commitment we do not make to reducing consumption, or increasing renewable use. Every foreign policy/domestic policy decision we take to keep our dollar high to get maximum revenue from the tarsands to shareholders (not the population) is a commitment to not building renewable infrastructure, or spending money on energy efficiency. So, trajectories count, and that is the underlying message from Swart and Weaver. To finish it off, here’s the PhD Comics Science News Cycle, which is very apropos. PS: Is Weaver and the Tarsands a good band name? And from comments, looks like Prof Weaver was on the CBC this morning, reprising his usual climate hawk self, will listen when they put the audio up. Here’s Prof. Weaver in the Huffington Post commenting on the study. More about this when I don’t have work to do. Swart, Neil C., and Andrew J. Weaver. “The Alberta oil sands and climate.” Nature Clim. Change advance online publication (February 19, 2012). http://dx.doi.org/10.1038/nclimate1421. Copyright © 2019 The Olive Ridley Crawl. All Rights Reserved. The Gridiculous Theme by bavotasan.com.